There is something to be said about the amount of fishing gear I have accrued over the last 20 years of my life, but I’ll leave that to my girlfriend, who seems to be very good at finding those words. I will say, I still have my original Snoopy Bobber I got when I was 7yrs old! I have seemingly endless drawers full of crank baits, gallon bags full of finesse worms, and dozens of spools of line. All this equipment makes fishing a chore at times. Deciding what lures to take or leave home, which rods to bring, and what test to use. The spur of the moment fishing trip with a buddy who calls while driving by is nearly impossible. If you’re anything like me you sit in traffic on the way home and see a river or small pond out the window and day dream about pulling panfish out while traffic dies down, but you don’t have any gear. I have found the solution! I recently received a Tenkara Teton Rod package for review and fell in love with the simplicity of it all. This beautifully made, telescopic fly rod was my answer to fishing the little stretches of river that I pass on my way home from work. Even if I carried my gear with me everywhere, reaching these spots with a tackle bag and a 6 foot spinning rod down the steep grades was enough to dissuade me from even attempting it. The Teton Rod is a 12 foot telescopic fly rod that collapses to 20 inches via 9 segments and weighs in at just 3.2oz! At first I was a bit skeptical to be honest. 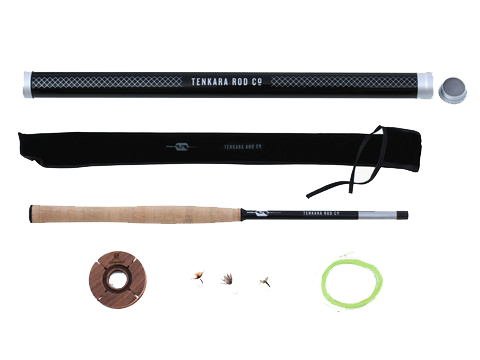 There is not reel, so it's a sort of hybrid between a fly rod and a cane pole. With a 25 foot reach, there are few creeks and rivers I can't fish with it. I keep a season-appropriate fly tied on. I also keep a couple more stuffed in the notches of the line spool. When moving to the next spot or calling it a day the line spool is easy to wrap the 13 feet of line around. The foam core of the spool dries out the line as well and it also floats. The Teton has a very precise 6:4 action and includes a swivel tip to prevent your line from twisting and tangling. This rod has changed my daily summer routine! MSRP: $159 ready to fish.